A few days from now, the European probe will make another Earth flyby and receive a gravitational assist towards its final destination, comet 67P/Churyumov-Gerasimenko. The spacecraft will pass within 2,500 km of our planet. Rosetta began its long voyage to 67P/Churyumov-Gerasimenko in 2004. Credits: ESA, image by AOES Medialab. Why will Europe’s Rosetta probe pass so close to Earth? The manoeuvre is called a gravity assist, or slingshot effect, in which the spacecraft effectively uses Earth’s gravity to gain speed. The closer the probe passes to large planets, the more momentum it can gather to propel it further into deep space. “This time, Rosetta will be propelled beyond Jupiter,” adds Philippe Gaudon. Thanks to these gravity assists, the probe will save enough propellant to modify its trajectory and reach comet 67P/Churyumov-Gerasimenko in 2014. Rosetta’s route to its final destination. Credits: CNES / S. Rouquette. Rosetta’s third and final flyby is also an opportunity to view our planet from an unusual angle and make a few adjustments. The scientists have access to the instruments throughout the voyage, but Earth and its atmosphere provide an ideal environment for calibration. 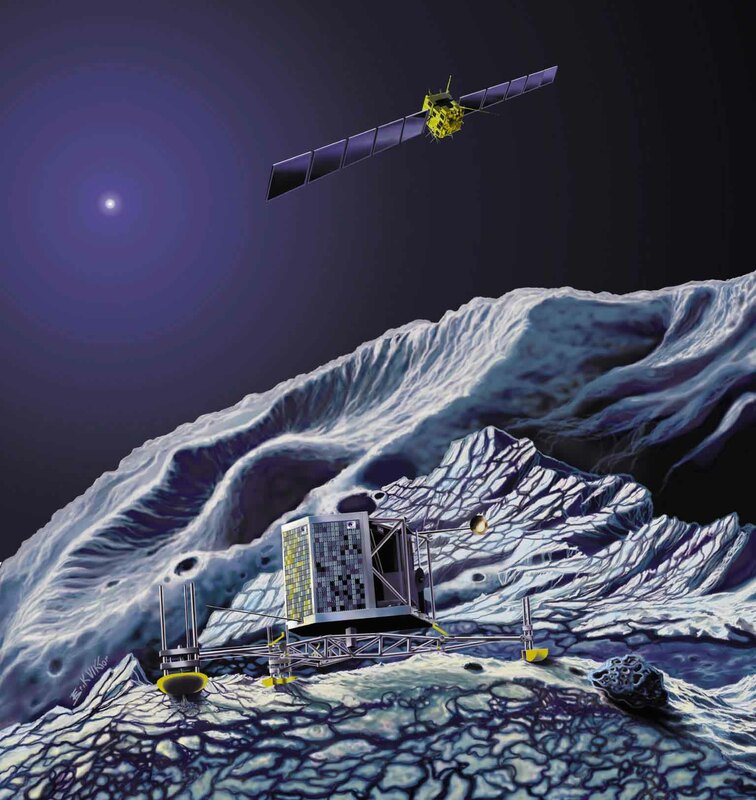 The Philae lander will touch down on the surface of comet 67P/Churyumov-Gerasimenko in 2014. Credits: Ill. ESA. 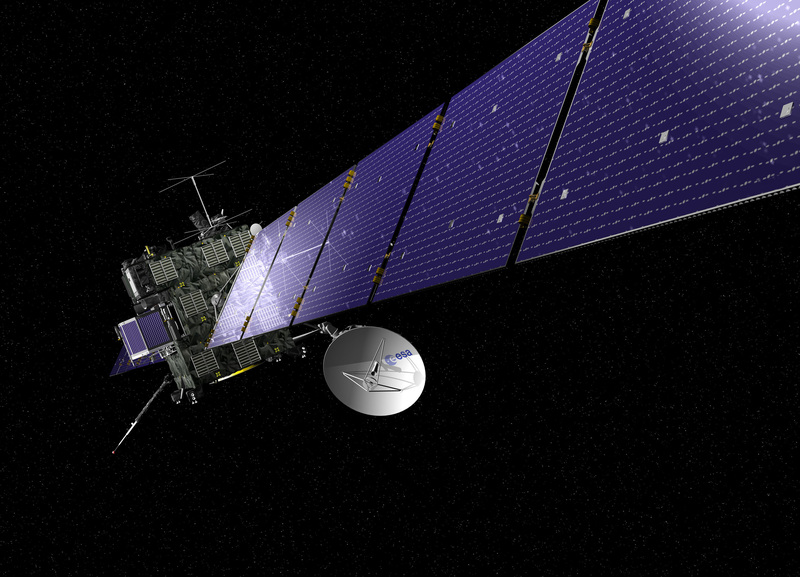 Rosetta will be in deep-space hibernation mode from 2011 to early 2014. During this time, scientists will be unable to communicate with it. So before Rosetta goes to sleep, the instruments must be perfectly calibrated and ready to study the comet when it wakes up. 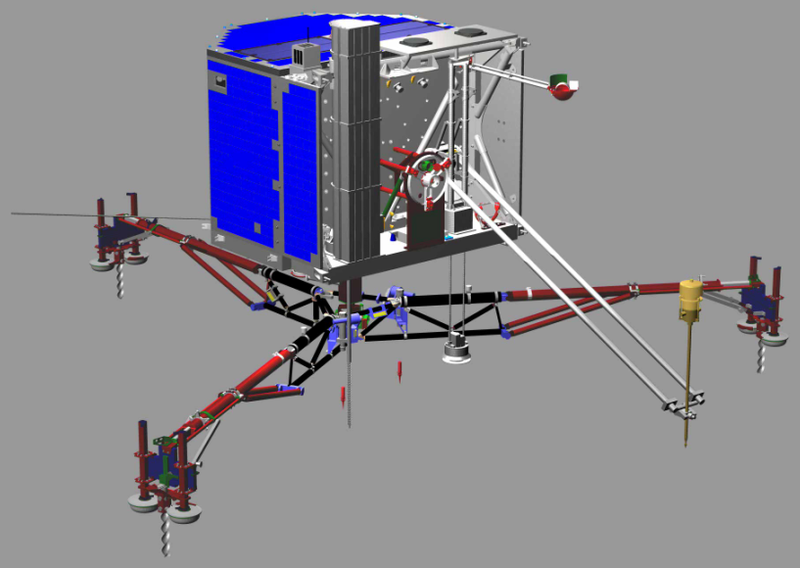 The Philae lander’s 10 instruments must be readied for operation before the spacecraft enters hibernation in 2011. Credits: CNES. Once these calibration operations are complete, CNES engineers will then have another task: convert the control rooms and adapt ground facilities for Rosetta’s final rendezvous with comet 67P/Churyumov-Gerasimenko. (2) OSIRIS (visible), VIRTIS (infrared), ALICE (ultraviolet) and MIRO (microwave).